I recently came across a really cool new cleaning product. Except that it isn’t new, and it’s not exactly a product, but there are products made from it and you can buy it. This is starting to sound like a riddle, so I’ll get to the point: SOAP NUTS!! What is a soap nut? Soap Nuts, which are actually berries, grow on trees and have actual soap in them! The berries contain saponin, which functions as a surfactant a.k.a. soap. They work to release dirt from fabric and other surfaces, then suspend the dirt in the water to be rinsed away. Some species of soap nut have also been found to be anti-bacterial and anti-fungal. Soap nuts have been in use for literal ages, in subtropic Asia, in countries such as India, China, Taiwan, and Nepal. 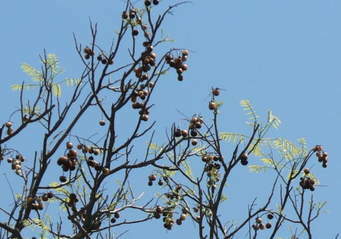 There is also a western soapberry tree that was used historically for the same purposes by Native Americans. What can I do with a soap nut? Soap nuts can be used to make an array of cleaning products. There is more than one method for using soap nuts, and the exact measurements may vary based on the exact species you are using. So I advise testing out a few methods to see what gets the best results with the nuts that you have available. That’s what I’ll be doing! But for this blog, I will cover some of the ideas and recipes I have found during my research. Put 4-5 nuts in a mesh or muslin bag, tie it off and soak it in warm water for about 5 minutes–just enough time to get your laundry sorted and put in the machine–then toss it in with your laundry. Soaking the soap nuts helps activate the saponin for best results. Reuse the same bag for approximately 10 loads of laundry, or until the soap nuts seem mushy. To test if the nuts are still good, give it a squeeze after letting it soak, you should see some suds come out. Note that you may need to adjust the number of nuts added to your laundry based on variable such as load size and water hardness. Update: I have been using whole Soap Nuts for my laundry for a while now and wanted to add some notes and some photos of the results. Firstly, I discovered that the machines in my apartment building do not get any hot water which is kind of a bummer. I mostly use cold water anyway because the fabrics last longer and it saves energy, but sometimes I’d like to sanitize a little deeper! Well, that is a problem for another day. To counteract the cold water issue I started soaking the Soap Nuts in hot water–not boiling, just out of the tap–for about 10 minutes (as described above). I realized after doing this a few times that it is actually a helpful gauge as to the lifespan of your Soap Nuts. Different nuts can last longer than others, or so I’ve read, so it is good to see how long yours will work to produce suds. Here is what very fresh, good quality Soap Nuts do to a cup of hot tap water. As they go through the wash a few times, the water will become less cloudy and more clear. This helps you know when to swap out for fresh nuts. If you want a “fresh” or “laundry” smell, you may want to add some essential oils, personally, I am very happy with scent free. I have done this a couple times and the good news is that you can revive them by soaking them in water, but I think it may shorten the lifespan a little. OK – that is all I have for an update right now, but stay tuned as I continue my testing and expand my Soap Nut knowledge! Another use of the whole nut is to take 10-12 nuts and let them soak in a bucket of hot water for about 30 minutes. Then use this water to wash your car, your floors, or anything else that you might need a bucket of water to clean. Since the wash is all natural and biodegradable the water can be reused to water your trees or plants. It may even keep pests out of the area watered. If anyone does try watering plants with the leftover water, I’d love to hear how it goes! (I don’t have any plants or yeard to test this out myself). It should be noted that when the whole nut starts to run dry, you can still boil it, powder it or make a paste out of it to get all of that saponin out of the shell! I have found a number of recipes for a liquid concentrate, ranging from 2 nuts per cup of water to 15 nuts per cup. I went with a middle ground of about 10 nuts per cup of water. Boil the soap nuts in the water, occasionally smashing them down with a bamboo spoon or something similar, for about 30 minutes. You can add essential oils if you want a scented product. Strain the liquid into a jar, and store in the fridge. Will last about 2 weeks. Another idea is that you can freeze it into cubes and just throw a cube into the laundry machine, dishwasher, or bucket of water. Apply a dab to your cleansing cloth for face or body cleansing. The antibacterial properties of the berry make this an excellent wash for acne prone skin, but it is also not drying and is very gentle for sensitive skin. For a jewelry cleaner, use either the straight concentrate or about a 50/50 mix with water, let jewelry soak in it for a bit and then scrub it with a toothbrush. This list could go on and on, get creative and post your ideas in the comments below! To make a paste you would take the leftover skins that you boiled to make your concentrate (you would want to remove the hard seeds at this point if you did not buy seedless) and put them in your food processor to create a mash. Then add coconut oil, or olive oil, or grapeseed oil (or whatever type of oil you prefer to use on your skin) and blend it down into a more liquid state. Once you apply to wet skin it will suds up and you can shave away! The paste of the skins can also be used as a concentrated cleaner and degreaser for tough messes. If you need something more abrasive check out this scrubbing block. You can just buy soap nut powder (and many of the other cleaners listed above), but if you are a DIY sort of person, take the dry nuts and just throw them in your blender, coffee grinder or food processor. I think you would want to use just the skins as the seeds don’t contain any saponin and are rather hard, so they would wear down your blades with no added benefit. The powder can then be used in basically the same ways as the liquid by putting a scoop into your laundry or into your dishwasher or dishwater. Now that I have been doing my laundry with the whole nut, in a bag. I have learned one more trick. After you have used the same nuts for laundry for a while (say 10 loads of laundry) they may not be great for more laundry, but you can still boil them or powder them to get every little bit of saponin out of them. They are the fruit that keeps on giving!! The possibilities seem rather endless at this point. I have read that insects are naturally repelled by the plant, which means that no pesticides are needed to grow them. It also means that it has the potential for use as mosquito repellent! Although everything I have read indicates the results are not in as to how effective it might be or the best way to apply it. It is all natural and very mild, so you can use it for your children’s laundry, or for someone with a skin condition such as eczema. You can also use it to shampoo your pet, and supposedly it will help discourage fleas and ticks from them. It will depend on where you buy your products or the soap nuts. But you can get as low as $.12 per load of laundry! The key is to buy in bulk (and why wouldn’t you when there are so many applications!) and reuse them until they are fully out of juice. For more chemical-free and non-toxic cleaners click here. I am a writer, editor and avid reader. I also happen to be trying to save the world, one little step at a time. I look forward to providing quick and easy steps you can take to make your life a little greener!! I’ve never heard of soap nuts. I’ve been looking for ways to make some natural cleaning products. I am so glad I came to your website. I just bookmarked your website so I can go back to it for reference in the future. I am so excited to make them. Thank you for sharing. Awesome! I can’t wait to hear what ways you try them. Thanks for the comment, Hong, I hope to hear from you again. Wow – really interesting and informative article. I had no idea what soap nuts were or how effective they were as a cleaning product. I’ll give them a try – particularly interested in trying them out as a glass cleaner. Glad to hear it, Mark, let us know how it works on your glass! I haven’t tried that yet, but I will soon, and I’ll let you know how it goes. What an informative post! I had no idea those little babies were so versatile. Will certainly try them…thanks! Yeah, they seem to be a truly “all-purpose” cleaner. I can’t wait to try more and more ways to use them! what a great article! im so glad i got to learn about this. i actually have some essential oils, and i know people say you can use them for cleaning… but bottom line is essential oils are expensive! so i haven’t made the switch over cuz i kind of cringe at the thought of using my expensive oils to clean my house. and i also like the fact that you said soap nuts dont have a sent, i think sometimes my clothes come out smelling really strong of detergent, and im not a big fan of that! Thanks for the comment Laila, I agree that many detergents have too strong of a smell. Personally, I don’t see a need to add any oils for scent, but some people really like it!